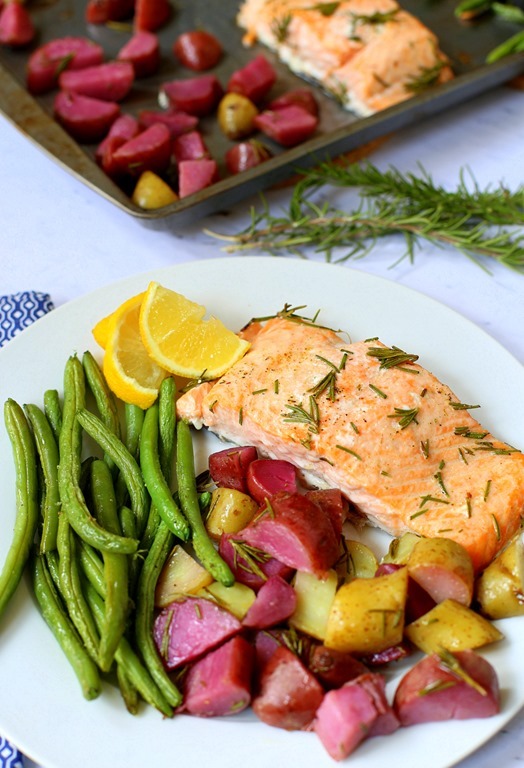 This recipe for Sheet Pan Paleo Salmon with Rosemary Roasted Potatoes and Green Beans answers the question “What’s for dinner?” with a simple one-pan meal. 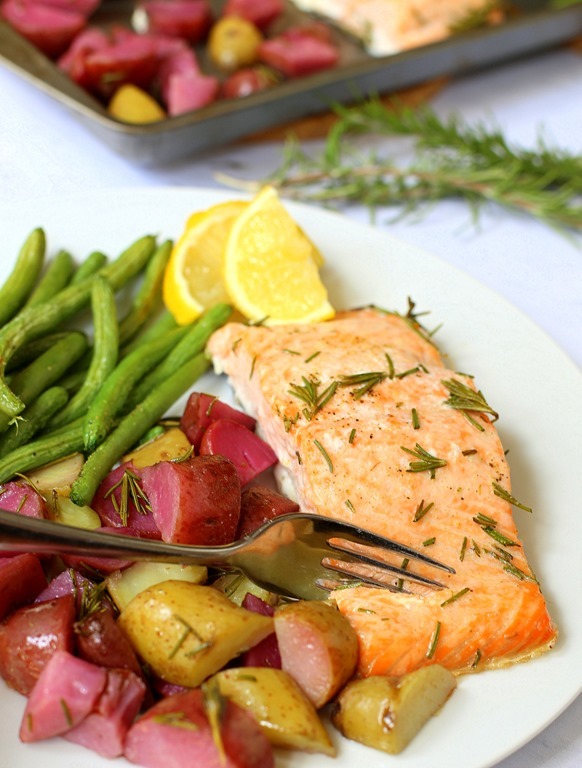 A combination of flaky salmon, crispy roasted potatoes and fresh green beans make this a satisfyingly flavorful recipe. Fact: Laziness inspires a LOT of recipes in our house. A lack of desire to do dishes is the driving force behind an embarrassing number of dinners we make (this Paleo-friendly one pot chicken cabbage bowl is a favorite for that very reason!) and today’s recipe was also born out of my desire to limit the number of pots, pans and cutting boards we’d need to clean after we were done eating. And that’s where one-pan and one-pot recipes come into play! Okay, so this dinner is technically a one-pan and a one-pot recipe, but the part of the recipe that requires the use of a pot can be prepped ahead of time if you’re looking for a shortcut (which I always am). I’ve seen “sheet pan” recipes popping up all over the place these days and every time I see one, I think, “YES! These are my people!” Even though all the bloggers and chefs out there may not be sharing sheet pan recipes because they hate doing dishes with a fiery passion like I do, I’m still happy to see them popping up all over the place simply because they are easy and that’s just what I’m looking for on a busy weeknight. 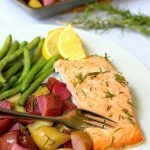 Today’s sheet pan Paleo salmon recipe has quickly become a favorite in our house because it combines our love for flaky salmon with slightly crunchy green beans and hearty roasted potatoes. Three delicious foods roasting away on one pan! Once you’re ready to make dinner, everything comes together in a flash and assuming the potatoes were pre-boiled, you’ll have a vibrant and healthy dinner ready for you in 20 minutes. Can’t beat that, right!? This recipe feeds two adults but can easily be doubled to feed four. I’ll often double it when I make it for me and Ryan because I’m a big fan of leftovers for lunch the next day. Preheat oven to 350 degrees. Heat a large pot of salted water to a boil. Add potatoes and cook until soft, approximately 15 minutes. Drain and set aside. Combine melted ghee, garlic salt and fresh rosemary in a small bowl. Stir. Spray a large sheet pan with cooking spray. Place the potatoes, salmon and green beans on the pan in an organized row. Pour rosemary ghee mixture over the salmon and the potatoes. (You may need to use your fingers to evenly distribute the rosemary since it tends to clump. Don’t be afraid to get a little dirty!) 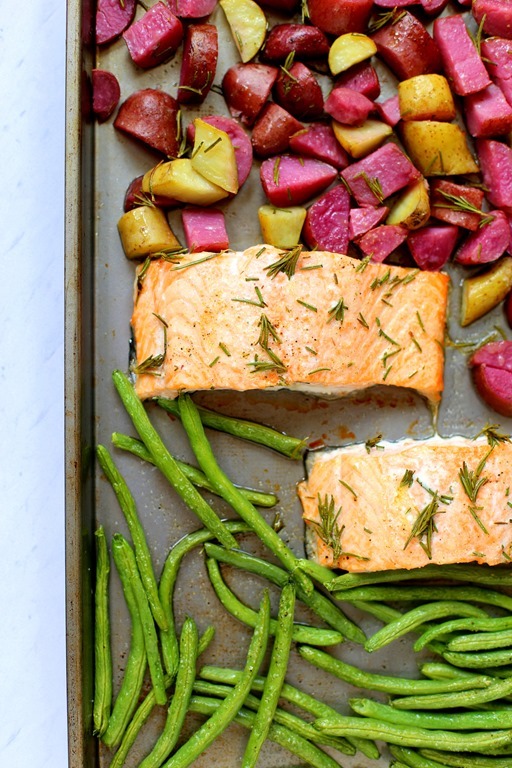 Toss the potatoes in the rosemary ghee on the sheet pan. Drizzle the olive oil over the green beans. Season with salt and pepper. Season the salmon and potatoes with additional salt and pepper to taste. Bake for approximately 18-20 minutes, until salmon flakes with a fork and the outside of the potatoes are slightly crispy. I never would’ve thought to boil the potatoes first, so smart! My husband doesn’t love salmon but the beauty with these meals is any protein can work! Thanks! I always feel like potatoes take so long in the oven, genius idea to boil them first. 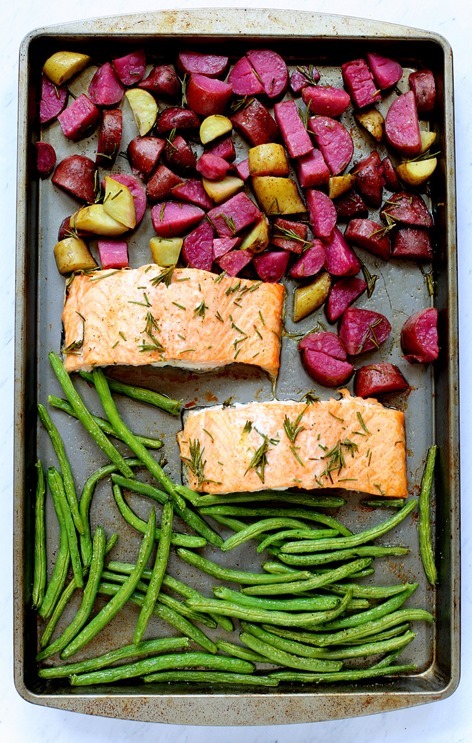 And LOVE sheet pan dinners during the work week, definitely trying this one! I like your style! Haha!! This is what I do too! One of my top life motto’s is work smarter, not harder! I’ve only had maybe one or two sheet pan meals so far, but each time I’ve loved them! I love salmon (my husband still needs to be convinced) and I can’t wait to try this recipe out. I hear you too about the whole dishes things; the less mess the better in my opinion! This dish is SO much prettier with cool colored potatoes! I haven’t made salmon in a while and i don’t usually get create with it, so great to find a new recipe for inspiration! First of all, this is a beautiful recipe. I love all the different colors in it. Second of all, I love this! Sheet pan meals are my favorite. I love really crispy, roasted potatoes – they add such a different consistency to a meal that I have been obsessed with lately. When I make sweet potato fries, one of my favorite spices to put on them is rosemary – again, it adds a really different flavor to any dish that tends to always bled in perfectly! Maybe i’m silly for not knowing this, but what is ghee and where can I get it? Not silly at all. It’s pretty much clarified butter. You can make it by heating your butter on the stove for 10-15 minutes and then straining it. Straining will remove the milk solids, and you’ll be left with the clarified butter 🙂 Or Google “how to make ghee” for a better explanation than the one I just gave! Well I just happen to have all of these ingredients on hand (including the baby purple potatoes) so I think I know what’s for dinner tomorrow night! Woo hoo! Oh yeah and a ghee/rosemary moisturizer is the added benefit of getting in there with your hands! THIS is my kind of dinner recipe! Actually…I made something similar last night with chicken, broccoli and potatoes. I need to be more brave about cooking fish at home, I love fish, but never think it’ll come out well. I love it when dinner is cooking in the oven and you realize there’s no clean up other than the pan you’re cooking in! Love the way sheet pan recipes are so versatile! This is one of our go-to meals! SO good and SO easy and fast for a busy mom! Looks delicious! I can’t wait to try it! It would also be great with asparagus! Yum!! Oh this looks so good! I love salmon so much and will have to give this a try. Yum! I’m totally making this, because I’m ALL for shortcuts and keeping it simple. Also, I’ve never made salmon in the oven. Nice work on this one, Julie! 🙂 Hope you’re having fun in Florida! oh I love this idea!!! What a great time and energy saver! And not to mention the lack of dishes!! love!!! Looks so yummy…..do you leave skin on salmon or remove it? I leave it on to bake it but don’t eat it when it’s done! This looks delicious and so easy to make! I love sheet pan dinners for the same reason. Definitely going to give this recipe a try next week! Hope you’re having fun on your trip! I love sheet pan dinners. We did one with turkey sausage last week and it was awesome. I put the potatoes in first to give them extra time, and then added the sausage and veggies. So easy! This looks absolutely delicious! I am so committed to one pan meals lately, and this definitely fits my “simple” criteria with healthy flare. Love the addition of rosemary to the salmon. What a tasty combination! This is awesome, definitely one I’m going to try! I am always concerned about the salmon not being cooked through, I usually have to leave it in longer that this calls for. I guess I just need to cut it up into smaller portions. Thanks, Julie! 90% of the time, ‘easy’ blog recipes are still way over my head! But this one is SO simple! It’s definitely on the list! I tried this last night, and it was delicious and so easy! Definitely will be making it again. I made this the other night and am eating the leftovers as I type. SO. GOOD. I added some whole grain mustard to give some extra texture. Delish!